October's webinar will describe and provide examples of how to quickly come up to speed on the HIPAA Regulations through HIPAA "Shorts!" It will also continue to explore the meta-concept of "How much HIPAA training is enough!" that was initiated and well-received in the August webinar. This webinar in October is a repeat of last month's webinar due to the last webinar being heavily oversubscribed. If you want a seat then you need to login about 10 minutes early. Privacy Rule Training Shorts and Micro Shorts! In last month's newsletter, we covered what we consider to be the basics of microlearning from our perspective. However, our webinar introduced the idea of search as a foundational building block for a micro-learning strategy, and I want to take the opportunity to elaborate on that a little this month. First, humans have a primal fear of being lost. The ability to venture forth and find our way back has been essential to our survival for millions of years. The sense of panic that envelopes us when our innate navigation system fails is palpable. Search is by far the most important activity that knowledge workers engage in on a daily basis, followed closely by communication. We need to be able to find, assimilate and communicate quickly and accurately to function (survive) in a knowledge-driven world. When we can't find what we need in the timeframe that we need it, not only do we become irritated, we often become disoriented. Therefore, the ability to find training when we need it is an essential imperative in any micro learning system. WHAT DOES AN MLS (Micro Learning System) LOOK LIKE? What we posit is a portal that has "native search" enabled but that also provides a navigational hierarchy (i.e., organizational menu structure) allowing users to find what they need quickly. The ability to perform a "Google Like" search within a portal and a navigational structure that manifests the internal components of the microlearning system enables users to navigate between training components easily. Let's again take the Security Rule, Privacy Rule, and Breach Notification rules ("Rules") as the primary subject matter components of our micro learning system ("MLS"). We would certainly desire to navigate available training by Rule because a Rule is foundational to our micro learning navigational strategy ("MLNS"), in the case of HIPAA. Further, we would want to find concept shorts and micro shorts within a Rule. As previously mentioned a Rule is an obvious navigational vector in this type of MLS. However, if our MLNS ended there, it would be functional to a certain extent but otherwise broken. Why? Because we would have left out other not so visible but mission-critical navigational vectors that are equally important. For example, our MLNS should allow a user to navigate via other subject matter domains. Other domains may include: (1) agile methodology training; (2) training that spans the three Rules; (3) Business Associate training; (4) training specific to different kinds of workforce members (e.g. those that process PHI access/amendment/accounting requests; (5) training for audits; and (6) training regarding project plans and how to launch your compliance initiative in general. In short, to deliver on the promise of find-ability, our portal must not only support search but, must also support an MLNS from multiple vectors-underpinning the concept that different workforce members have different "worldviews" of their training requirements. This article has discussed other requirements of a micro-learning system that must be present for it to succeed on its dual objectives: (1) provide high quality curated content in "byte" sized chunks; and (2) make that content's "ambient find-ability" manifested through an MLNS that supports the necessary navigation vectors. Training for personnel that is assigned the responsibility for disposing of PHI. 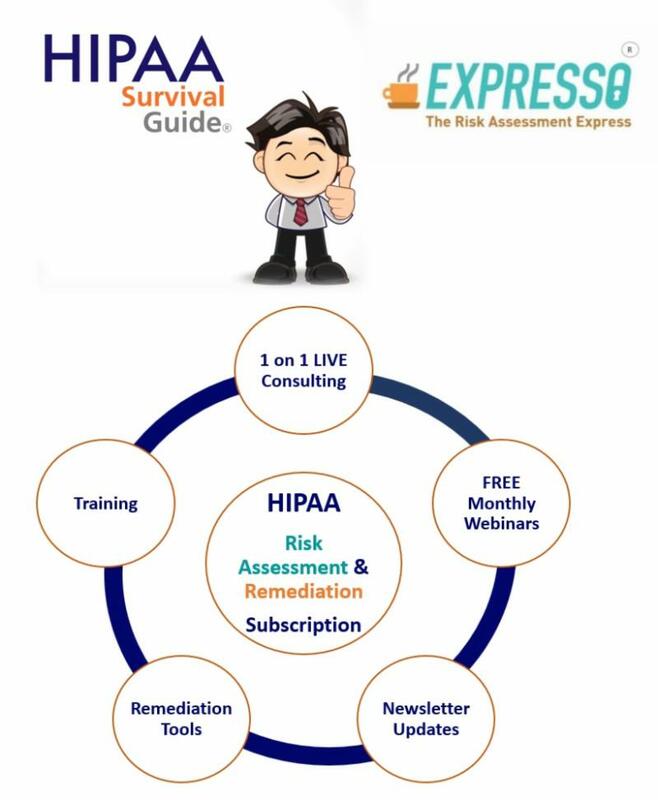 A full 360-degree circle of Risk Assessment and Remediation products are provided in 3Lions Publishing Inc.'s HIPAA and Expresso Subscription Plan.